Motor Man isn’t aware of this yet, but we have a slight emergency. My supply of barn photos is running dangerously low. I had to go all the way back to March for this one. 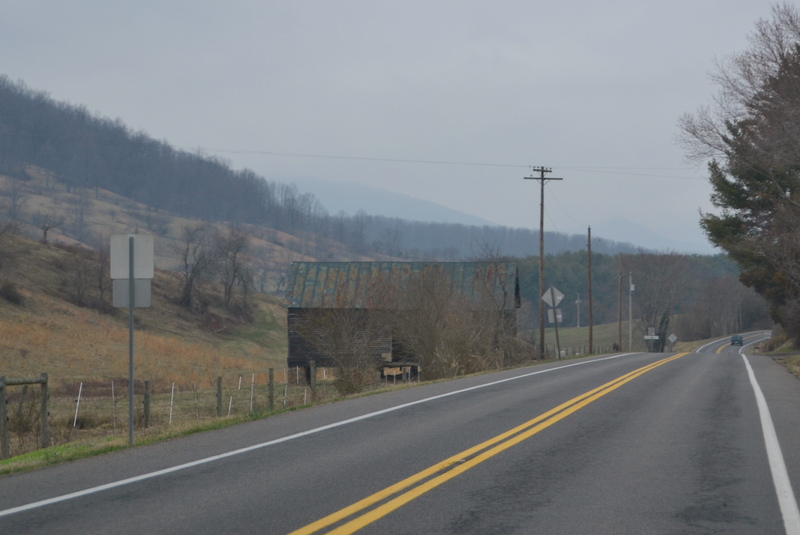 It was taken during our trip to meet our friends, Pam and Dave (pawrents to Sammy, One Spoiled Cat) for lunch and antiquing in Sperryville, Va. This was our first glimpse. As you can tell, it was an extremely overcast day. 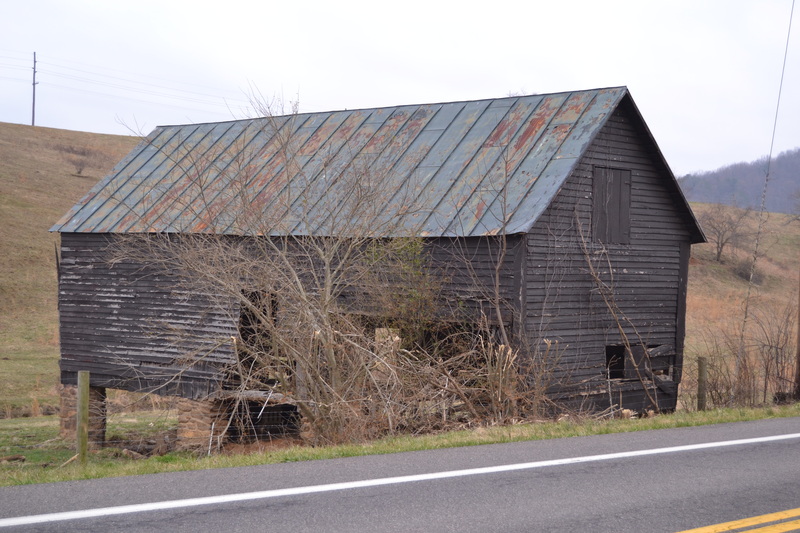 This old barn sits right at the edge of the highway. And from the looks of it, I don’t think I’d want to risk keeping anything of value inside. And now, I’m off to let Motor Man know that we need to start planning a barnstorming trip – ASAP. This entry was posted in Traveling Days and tagged barn charm, sperryville va. Bookmark the permalink. have you heard from Linda lately? sure miss her … just thinking about her & wondering how she is? i never got to meet her in person. i try to always keep in touch with my VA bloggy friends. She posted a photo on FB last week – she and her hubby are on a trip to Ireland. I’ll send her a message that you asked about her! I need to go somewhere to find barns….!!! I too like how the barn is sitting on bricks and have never seen an old barn built that way before! When you see an older building so close to the highway, it makes you wonder if the road was re-routed after the barn was built. I don’t think I have ever seen a barn sitting JUST on rock columns. You are right I wouldn’t want to put anything of value in it. It does for sure have charm though! Good Morning!! I like these photos. Different location, different look. And, oh no, low on barn pics!! Hurry… get Motor Man on the job. Thanks for your wishes and for stopping by yesterday for my Gotcha Day Pawty! So close to the road! I suspect the barn was there first, huh? Glad you had a pic in the archives to share and I am looking forward to the next episode :-). wow, the ‘jacked up’ rear end is interesting! and scary, i agree. 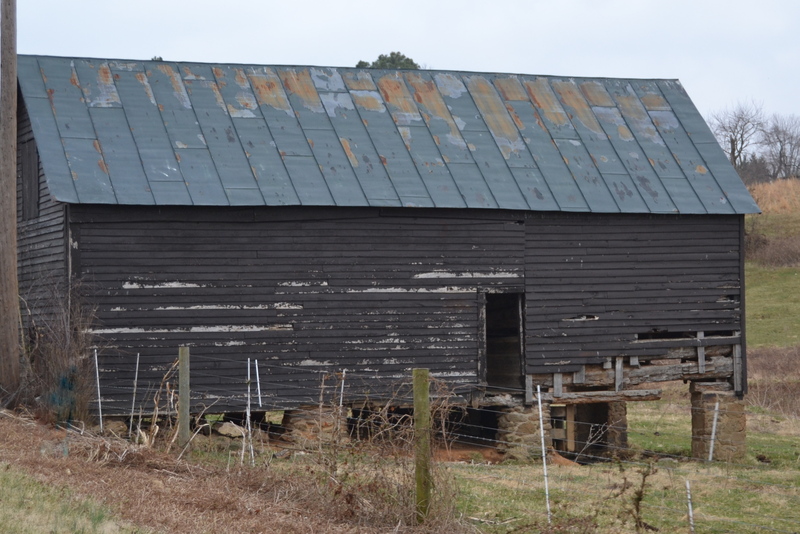 Southampton County is a good location for old barns. My husband & I will be happy to help you out. In spite of the used look of this old barn you caught in the mist – it has character and yes – charm! Good one! At first, I hardly saw it, blending into the grayness of the day. It’s a great find – and I’m glad you got it because it looks like it could tip over at any time! PS – My barn photo supply is also dangerously low. Time to get out there! I am sure there are many more barns out there for you to capture. This barn caught my eye because of the high stone legs. I don’t remember seeing a barn on those kind of legs before?? But the horse pictures more than make up for the lack of barns! The road almost got it, nice looking barn and a great shot.